Good morning. I am honoured to join you all here at the Education Colloquium organised by the Hong Kong Association of the Heads of Secondary Schools. The theme of the Colloquium is "Vision 2047". According to the Organisation for Economic Co-operation and Development, 65 per cent of children today will, in the future, be doing jobs that have not even been invented now. Indeed, many jobs that exist today were never heard of 30 years ago. One good example is the rapidly developing and proliferating social media that is giving rise to new professions such as YouTubers, bloggers and e-sports players so vastly attractive to the youth. What will the world be like for our future generations who will be going to school or joining the workforce in 30 years' time? How should we prepare them for the fast and disruptive changes in the new era? Talent is the most important ingredient in Hong Kong's continued development, and education is the key to nurturing talent. Every dollar spent on education is therefore an investment for our future. Education has long been the lion's share of government spending, accounting for 21.5 per cent of public recurrent expenditure. Through learning, young people can explore their potential, cultivate their interests and enhance their strengths so that they are well equipped for the future and able to contribute to the community. As stated in the Chief Executive's inaugural Policy Address, our education policy aims to nurture the future generations into quality citizens who are socially responsible and equipped with a sense of national identity, an affection for Hong Kong and an international outlook. To this end, we need to create a stable, caring, inspiring and satisfying teaching and learning environment for our students, teachers, parents and school heads. As soon as the current-term Government took office in July last year, we immediately increased the annual recurrent provision to education by $3.6 billion with effect from the 2017/18 school year to roll out a package of priority measures covering the whole spectrum of the education system from kindergartens, primary and secondary schools, integrated education and special education to post-secondary education. For kindergartens, we have implemented the Free Quality Kindergarten Education Policy from the same school year to provide good quality and highly affordable kindergarten education and enhance the accessibility of students to different modes of services that suit their specific needs. As for primary and secondary education, the teacher-to-class ratio in public sector primary and secondary schools has also been raised by 0.1 across the board from the current school year, providing over 2 000 additional regular teaching posts. Besides, an extra recurrent cash grant of $25,000 per month will be allocated to all these schools, including special schools, to strengthen the IT staffing support for e-learning and other IT-related education initiatives. Each school will also have an extra teaching post to take up the role of Special Educational Needs Coordinator. To support secondary school teachers' continuing professional development, we are rolling out a pilot scheme for them to take paid leave for non-local study programmes of about one to three months. The first three programmes, to be held in Finland, Australia and the UK, have recently been introduced in 2017/18 school year. Our higher education institutions carry the mission of grooming high-calibre talent for Hong Kong. We therefore consider it necessary to provide further support to students to invest in our future. Hence, the current-term Government has introduced a non-means-tested annual subsidy of $30,000 for eligible students pursuing self-financing undergraduate programmes offered by relevant institutions in Hong Kong. We also provide a non-means-tested annual subsidy of $5,000 for eligible students pursuing eligible undergraduate programmes on the Mainland. To help us groom a top cadre of talent with global vision, an international network and world-class education to spearhead our city's long-term economic and social progress, we will regularise the Hong Kong Scholarship for Excellence Scheme from the 2019/20 academic year to support outstanding local students to pursue studies in world-renowned universities outside Hong Kong. In a bid to promote multi-faceted excellence, we have injected $200 million into the Multi-faceted Excellence Scholarship to support local students who excel in areas other than academic performance such as sports, art or community services to pursue undergraduate studies. We will also regularise the Study Subsidy Scheme for Designated Professions/Sectors from the 2018/19 academic year onwards and increase the number of subsidised places to about 3 000 per cohort to provide a wider pool of talent with diverse skills. It is expected that about 13 000 students will benefit from the scheme each year, involving an expenditure of about $850 million per year. The Government will inject an additional $1.5 billion into the Continuing Education Fund and improve its operation by expanding the range of the courses covered, stepping up quality assurance for the registered courses and enhancing protection for applicants. We estimate that an additional 150 000 or more citizens will be able to receive the subsidy and the Fund's operation will be extended to 2024. We will also inject $1.2 billion into the Qualifications Framework Fund to bolster its functions so as to enhance recognition of qualifications for different industries and provide youngsters with quality-assured pathways for continuous studies and further career development. To sustain our education quality in the long-run, we will carry out in-depth reviews on eight key areas of education, including professional development of teachers, curriculum arrangement, assessment system, vocational and professional education and training, self-financing post-secondary education, school-based management, parent education, the policy and funding on research and student hostels. I believe that most of you have heard about the Belt and Road Initiative pioneered by our motherland as the next growth engine to the global economy. Covering 4.4 billion people of over 60 countries and accounting for over 30 per cent of global economic value, this national development strategy will certainly create enormous opportunities for Hong Kong in the next few decades. At the same time, brilliant prospects are also presented by the Guangdong-Hong Kong-Macao Bay Area development. It is a mega regional co-operation plan among the 11 cities of 66 million population in south China with a combined gross domestic product of over $10 trillion (about the size of Australia or Korea), and with Hong Kong as one of the key players. To prepare our students for these geo-economic ventures of a mammoth scale in the years ahead, we will include relevant knowledge into the school curriculum. For example, in Liberal Studies, Geography, Economics and Life and Society, we may introduce the vision and action plans of the Belt and Road Initiative, its importance to the future development of Hong Kong, the opportunities created, current international political structure and financial and economic development. In the subjects of Chinese History, History, Arts and Religious Studies, we may bring in the history, religion and culture of countries along the Belt and Road. Students are also encouraged to strengthen their language skills to facilitate their people-to-people link, such as learning languages of other Euro-Asian countries in addition to Chinese and English. We will continue to allocate more resources to help our young people understand the work culture and career prospects in different places, allow them to establish interpersonal networks, broaden their horizons and assist their future career planning. In particular, more internship opportunities on the Mainland including the Bay Area, as well as in Belt and Road countries and other parts of the world, will be provided for our young people. Take the Mainland exchange programmes as an example. In the 2016/17 school year, about 60 000 students joined and benefitted from the exchange. We have increased the quota to over 100 000 places this year to ensure that every primary and secondary student can join at least one such programme to the Mainland. We have also allocated an additional $100 million in 2017-18 to expand the International Youth Exchange Programme to encourage young people to increase their global exposure. To provide more opportunities for our young people to appreciate different cultures and the development of other countries, we will proactively sign more Working Holiday Scheme agreements with suitable partners, including countries along the Belt and Road. This would enable Hong Kong young people to learn more about the indigenous customs and culture as well as the social development of these places through an extended stay in the host economy. Breakthroughs in innovation and technology have brought about paradigm shifts in different economic and social spheres, changing our daily lives and business modalities. We need to have a pool of innovative and IT-savvy talent to open up new markets and seize new opportunities to sustain the competitiveness of Hong Kong in the long term. That is why we have set for our education policy the objective of promoting science, technology, engineering and mathematics (STEM) education in schools. We have updated the curricula of the STEM Education Key Learning Area. Apart from cultivating students' interest in the relevant subjects and developing among them a solid knowledge base, we aim to strengthen their ability to integrate and apply knowledge and skills across different STEM disciplines, to nurture their creativity, collaboration and problem-solving skills, as well as to foster their innovation and entrepreneurial spirit as a prerequisite for success in the 21st century. Intensive training programmes for heads and middle managers of all public sector primary and secondary schools have also been launched since this school year to strengthen their capacity in planning and implementing school-based STEM-related activities. Other training and teaching support for teachers are also available from the STEM Education Centre, which has been in operation under the Arts and Technology Education Centre in Lok Fu since last October. As students will also want more opportunities to apply and share what they have learnt, we will collaborate with tertiary institutions and other relevant organisations to arrange more large-scale quality activities for students, such as education fairs related to science and technology. To train and gather more technology talent and to encourage them to pursue a career in innovation and scientific research, we are going to launch a $500 million Technology Talent Scheme in the current year. One of the initiatives is to establish a Postdoctoral Hub to provide funding support for enterprises to recruit postdoctoral talent for scientific research and product development. Besides, to incentivise more research work by local students, we have injected $3 billion into the Research Endowment Fund to provide studentships for local students enrolled in research postgraduate programmes funded by the University Grants Committee. We have also set aside no less than $10 billion as funding for university research, which will be disbursed upon the completion of the review on research funding by a task force led by Professor Tsui Lap-chee. To create a pool of top talent from around the world in Hong Kong and raise the standard of our technology talent, the Government strives to attract top overseas scientific research institutions to Hong Kong. Some successful cases include the innovation node set up in Hong Kong by the Massachusetts Institute of Technology and the local research centre set up by the Karolinska Institutet from Sweden. These illustrious institutions have all shown their confidence in Hong Kong as a fertile ground for innovation and technology. At the policymaking level, it is important to chart a holistic plan for nurturing talent in Hong Kong in a sustainable manner. In this connection, I will chair the children commission, the Youth Development Commission and the Commission for the Planning of Human Resources to be established within this year. These high-level committees will co-ordinate resources and efforts of the Government and relevant sectors to ensure that people of different age groups are prepared to meet the short-, medium- and long-term development needs of Hong Kong and keep up with our country's latest developments as well as the evolving trends in the global market. 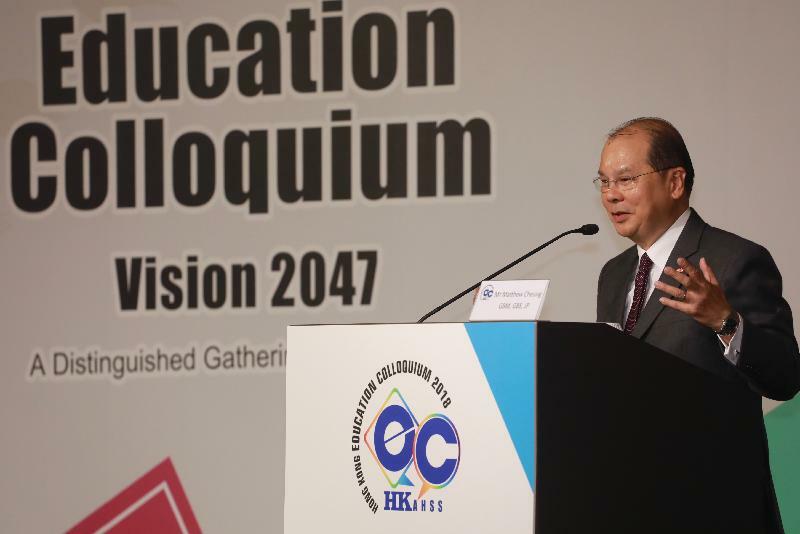 On this forward-looking note, I would like to express again my heartfelt gratitude to the Hong Kong Association of the Heads of Secondary Schools for organising this Colloquium. It offers a valuable platform for the education sector to exchange views on the vision of better education to propel our next generations forward all the way through 2047. I wish all participants a fruitful experience, our overseas guests a very enjoyable stay in Hong Kong, and everyone a healthy and prosperous new year.